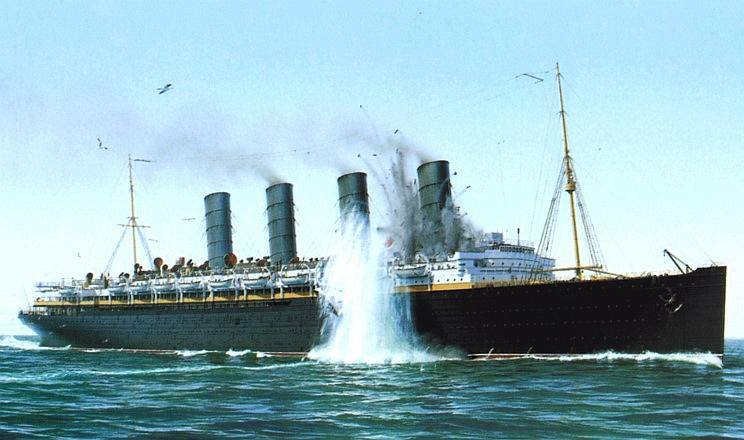 Was the Lusitania a Legitimate Military Target? Her sinking in 1915 with the loss of almost 1,200 innocent lives and caused such international outrage that it propelled the U.S. into the First World War. But in recent years numerous diving expeditions to the wreck have revealed a dark secret about the cargo carried by the Lusitania on its final journey in May 1915. Munitions they found in the hold suggest that the Germans had been right all along in claiming the ship was carrying extensive war materials and that she may have arguably been a legitimate military target. The Cunard vessel, steaming from New York to Liverpool, was sunk eight miles off the Irish coast by a U-boat. 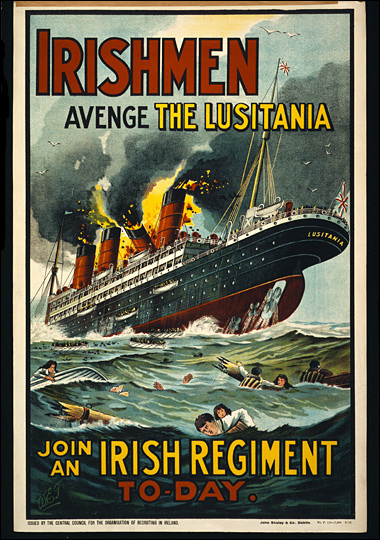 Maintaining that the Lusitania was solely a passenger vessel, the British propaganda machine wasted no time, quickly accusing the 'Pirate Hun' of mercilessly slaughtering civilians and stirring up anti-German anger, especially in the U.S., where 128 of the 1,198 victims came from. Robert Lansing, the U.S. secretary of state, later wrote that the sinking gave him the 'conviction we would ultimately become the ally of Britain'. Americans were even told, falsely, that German children were given a day off school to celebrate the sinking of the Lusitania. The disaster inspired a multitude of recruitment posters demanding vengeance for the victims. 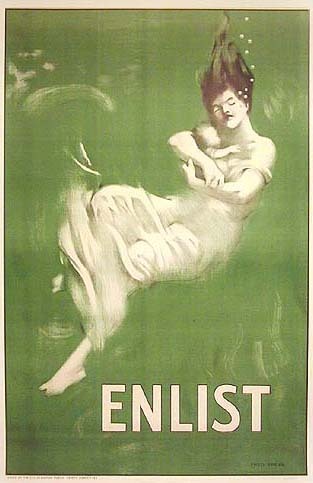 One, famously showing a young mother slipping below the waves with her baby, carried the simple slogan 'Enlist'. The Germans had insisted the Lusitania - the fastest liner in the North Atlantic - was being used as a weapons ship to break the blockade Berlin had been trying to impose around Britain since the outbreak of hostilities in August 1914. Winston Churchill, who was first Lord of the Admiralty and has long been suspected of knowing more about the circumstances of the attack than he let on in public, wrote in a confidential letter shortly before the sinking that some German submarine attacks were to be welcomed. The discovery may help explain why the 787ft Lusitania sank within 18 minutes of a single German torpedo slamming into her hull. Some of the 764 survivors reported a second explosion which might have been munitions going off but has long been attributed to highly flammable coal dust in the Lusitania's nearly empty coal bunkers igniting -which it can do . . . but did it? Gregg Bemis, an American businessman who owns the rights to the wreck and is funding its exploration, said: 'Those four million rounds of .303s were not just some private hunter's stash. 'Now that we've found it, the British can't deny any more that there was ammunition on board. That raises the question of what else was on board. 'There were literally tons and tons of stuff stored in unrefrigerated cargo holds that were dubiously marked cheese, butter and oysters'. 'I've always felt there were some significant high explosives in the holds - shells, powder, gun cotton - that were set off by the torpedo and the inflow of water. That's what sank the ship.' Mr Bemis is planning to commission further dives next year in a full-scale forensic examination of the wreck off County Cork. Bemis was granted a five-year license in 2007 by the Irish government to conduct limited excavations at the site. He originally bought the vessel in 1968 for $2,400 from the Liverpool & London War Risks Insurance Association. Lusitania, according to her 'official' cargo manifest was carrying among her cargo rifle/machine-gun ammunition, shrapnel artillery shells without powder charges and artillery fuses. The cargo manifest also included 46 tons of aluminium powder, which was used in the manufacture of explosives and which was being shipped to the Woolwich Arsenal. Author Steven Danver states that the Lusitania was also secretly carrying a large quantity of nitrocellulose (gun cotton), although this was not listed as such on the cargo manifest either. Furthermore there was a large consignment of "fur", sent from Dupont Nemours, and some 90 tons butter and lard destined for the Royal Navy Weapons Testing Establishment in Essex. 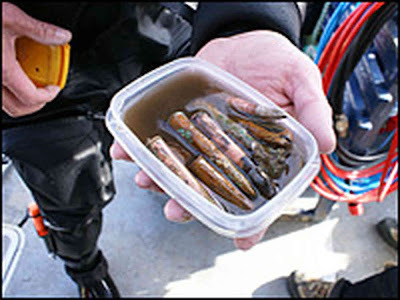 "Further research needs to be conducted, but if the discovered ammunition was found in an area where cargo was not known to be stored on board, it strongly supports the argument that the Lusitania was functioning as more than a passenger liner," says Fionnbar Moore, senior archaeologist with the Underwater Archaeology Unit of the Irish Department of Environment, which monitored the dive. The bullets are in the hands of Irish authorities, who under maritime law are now responsible for establishing their owner. Further expeditions will search for additional evidence of munitions. The British government has never done anything to help its case, numerous incidents over the past few decades and compelling evidence discovered on the wreck only fuels the speculation of what else was on board. In 1982 various items were recovered from the wreck and brought ashore in the United Kingdom from the cargo of Lusitania by the British Government. Complex litigation ensued, with all parties settling their differences apart from the salvors and the British Government, who asserted "droits of admiralty" over the recovered items. The judge eventually ruled in The Lusitania, that the Crown has no rights over wrecks outside British territorial waters, even if the recovered items are subsequently brought into the United Kingdom. The case remains the leading authority on this point of law today. More chilling is evidence collected by Dublin-based technical diver Des Quigley, who dived on the wreck in the 1990s. He reported that the wreck is "like Swiss cheese" and the seabed around her "is littered with unexploded hedgehog mines". In February 2009, the Discovery Channel TV series Treasure Quest aired an episode titled "Lusitania Revealed", in which Gregg Bemis and a team of shipwreck experts attempted to search for further ammunition after the discovery of the bullets. As they explored the wreck via a remote control unmanned submersible. At one point in the documentary an unexploded depth charge was found in the wreckage, in plain sight, clearly seen by the remote control submersible's video camera. Professor William Kingston of Trinity College, Dublin has said, "There's no doubt at all about it that the Royal Navy and the British government have taken very considerable steps over the years to try to prevent whatever can be found out about the Lusitania"
For all the public and media interest in the debate over the sinking of the Lusitania, the question and maybe realisation we are really left with is that was the British government any less villainous to use the cloak of innocent civilians to smuggle war materials through a blockade than the Germans were for sinking her?